We all can identify with this scenario: a delay causes us to start our commute 10 minutes late. The timing of the late start adds 30 minutes to our commute, and we end up missing an important meeting. This is the example that Agile expert Bhavani Krishnan uses to illustrate the time sensitive nature of effectively communicating shifts in priorities, in the on-demand webinar: 4 Communication Strategies for Agile Success. Just as a 10-minute delay in our daily commute can lead to more costly consequences, delays in communicating new priorities can hinder the ability to deliver the right product to the market at the right time and result in costly missed opportunities. Within a constant shared vision, priorities often change. 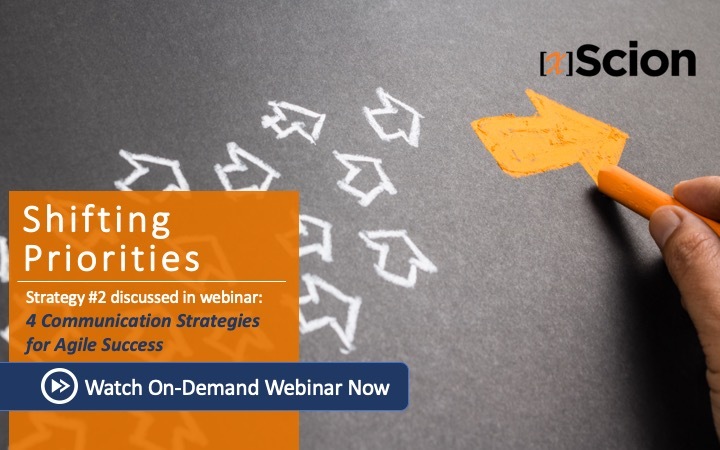 According to Mason Chaudhry, xScion’s COO, a common challenge for organizations is “seamlessly deconstructing the big picture into vision and priorities that stakeholders at all levels agree to work with.” The on-demand webinar offers approaches to timely communication of shifts in priorities across an organization. Organizations traditionally adhere to a hierarchical, command-and-control model, but this can be an impediment to quickly communicating priority shifts to all levels. Krishnan’s recommendations draw on adopting a Kaizen-style management approach that is less top-down, more horizontal, and involves continuous, incremental improvement across all functions and all employees. Doing so removes impediments to quick communication and helps minimize the costs of delay. When priorities change a culture of transparency allows the new changes to be widely and quickly visible throughout an organization. Quick and seamless communication of priority shifts to all organizational stakeholders allows for timely responses that reduce the cost of delay and position organizations to best capitalize on time sensitive opportunities. Watch the webinar (available on demand at here) for more examples and an in-depth discussion of how the right organization structure can improve the communication of shifting priorities.